Trapezista and I headed up the coast to check out Ucluelet and Tofino. 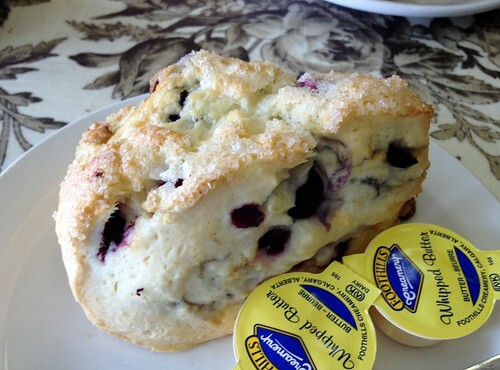 On our way there, we stopped at Old Town Bakery in Ladysmith. Trapezista had heard that their cinnamon buns were a must try. 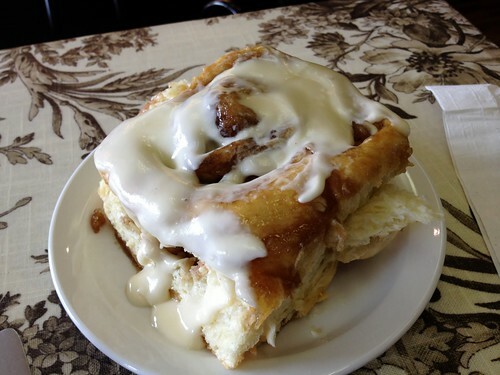 Trapezista got the renown cinnamon bun with sliced almonds and cream cheese icing. I don't remember how much it was, but definitely under $3, which makes the giant bun a steal. She really enjoyed her bun. There were other flavours, such as a berry one and a peanut butter cream cheese one. I was a wimp and was overwhelmed by the ginormous cinnamon bun so I ordered the blueberry and white chocolate scone ($1.85) instead. It was quite good and still big. I did eye her bun and wondered if I should have stuck to the bakery's specialty. 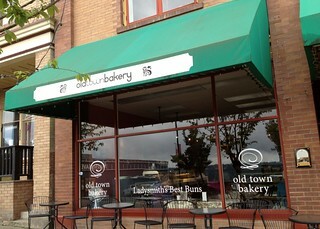 Old Town Bakery seemed to be busy on a weekday morning. 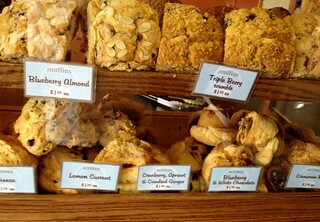 Their other baked goods include large square shaped muffins, cookies and freshly baked breads. There was also a small lunch counter with salads.